It has been many years since Texas has experienced a drought like the one we’ve dealt with this year. Supposedly, these types of conditions could go on for another 1-3 years. Let’s hope the “professionals” are wrong in this instance. Lake Conroe is the lowest I’ve ever seen it. The north side of the 1097 bridge is completely dry with grass growing. Water normally fills this up all the way to the treeline. The south side of the bridge shows a lot of land/sand as well. These people had lake front homes with FEET of water….now, they could be considered beach homes! It’s all quite sad. I do hope we get a lot of rain this fall. We need at least 20″+. Anyone have some they care to send this way? Wednesday I forgot my Garmin so I didn’t have anything to tell me when my intervals were up and I didn’t plan on watching the clock on my phone that closely. So, I decided to change up my running a bit and ran the whole mile. Forget the intervals…I’m going all.the.way baby! Ok, so it wasn’t all that pretty! Yes, my pace wavered quite a bit. I started off strong but the end was tough. About half way through I wanted to stop, but forced myself to keep going. In fact, I noticed my shoe came untied a bit before that and I refused to stop and tie it because I knew I wouldn’t start again. So, while it may not be pretty, it’s actually not terribly bad! Yesterday, was another CrossFit day. We did some skill work then tried to decide how to do the WOD. The day before they had done a 15 minute AMRAP. Thursday was supposed to be a 20 minute AMRAP. Shane wanted us to just do 8 rounds instead of an AMRAP but I wasn’t sure if I could get 8 rounds in. So, we settled for 8 rounds with a cut off of 20 minutes. 8 Rounds or 20 Minutes, whichever was first. I did ok. The ring dips and wall balls were quite tough and I’m not sure why. 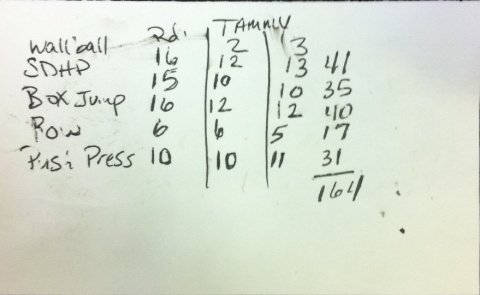 I started with a 16# med ball, which wasn’t too bad last time, but had to drop down to a 12# after round 2. I guess 20 in a row was just too much. 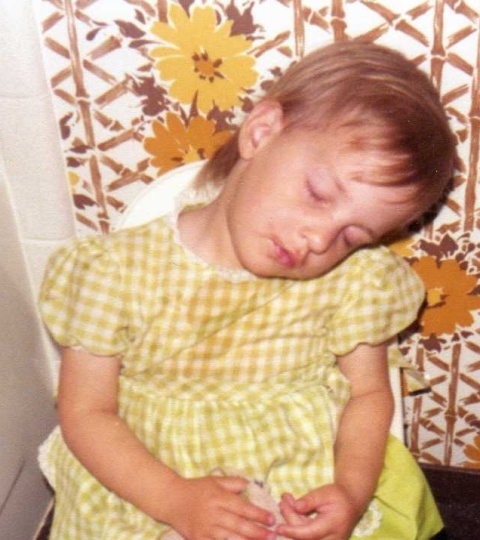 The dips were hard to do too. They got more pathetic as the workout went on! All in all I finished with 7 rounds and only 7 wall balls left in my 8th round. I was so close! Something that I’m noticing during my workouts is I’m not pushing past the threshold. I should be pushing harder rather than stopping to catch my breath. That’s something I’ll work on from here on out. If I’m going to do this marathon, I will need to learn how to push through the mental hurdles and pain to finish. Today is a rest day but tomorrow brings on a 12 miler! Not sure how this is going to go, but we’ll see. My foot seems to be feeling better, so I’m glad of that. Oh, guess what came in today!! I finally have multiple pairs of Drymax socks! Anyone who has been following this blog for a bit knows how much trouble I’ve had with blisters. It’s not been pretty. I thought it may have been the way I was walking, but come to find out it was just because my feet sweat so much (I know…ew). I had tried Thorlo’s before but I still got blisters in them. These are the only pair of socks I’ve used that have helped me stave off those little buggers. From now on, I’m only using Drymax socks for running/walking. 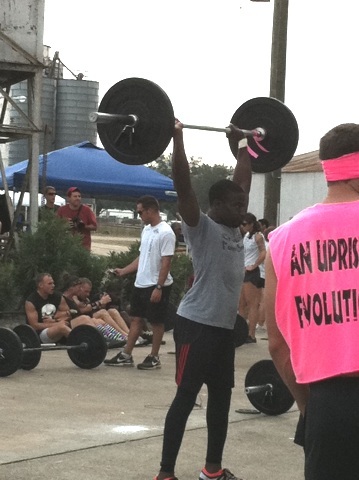 This entry was posted in Health, Race Training, Sports, Workout and tagged 1 Mile Run, AMRAP, Crossfit, Drymax Socks, gear, Ring Dips, Sumo Deadlift High Pull, Wall Balls on October 21, 2011 by Tammy. Thursday was a good workout. I was extremely happy with my results and finally felt like I’d accomplished something! Well, I’m nothing if not consistent! The ring dips are by far the most difficult for me right now since I have weak triceps. The burpees sucked but they weren’t too bad! I slammed down pretty hard a couple of times on the first round. On rounds 2-4 I did the step back instead of the jump. 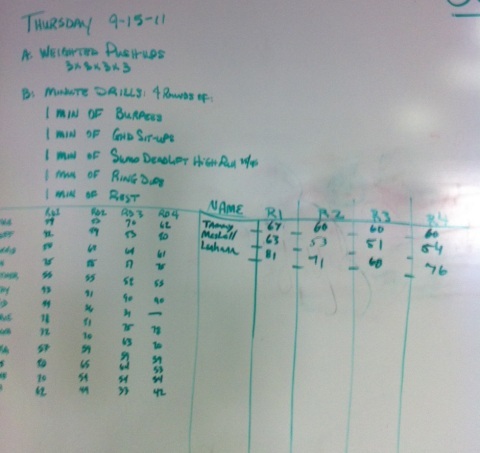 I averaged about 10 burpees per round but was able to make up the numbers on the SDHP. That was my strongest round. Cash in – 30 double-unders (before athlete touches bar) Cash out – 10 burpees (as soon as the athlete leaves the bar) Caveat – before the relieving athlete begins double-unders the team must complete inter- locked (arms) team sit-ups equivalent to the total number of reps completed of Bear Complex. Yeah…it was brutal! Needless to say, I was glad not to be one of them. Especially since the burpees and sit ups were done on cement. Clara and Kelly’s box, CrossFit Point Break, came in first! Way to go everyone. Don’t ask me about the pink because I just don’t know! Sunday was our big run. We met up at 6:30 and got in almost 6 miles. It was cloudy, which made the temp quite nice! As soon as I made it back to my car it started raining pretty good. So, we had perfect timing! I started the first mile with 1/1 run/walk intervals but ended up doing 2/1 intervals for miles 2-6. My hips started hurting about 3 miles into the run. I’m pretty sure it’s because I hopped into a 6 mile run after being off for 3 weeks instead of working up to that distance. I felt like I could probably keep going, as I wasn’t tired. That’s good news because my 10 mile race will be coming up before too long! Next week I’m going to do 3/2 intervals and hope that I can work up my endurance. Clara and Kelly’s CrossFit box is having a running clinic on Oct. 1st where they’ll be training us on the Pose run method and going through drills and whatnot. I went ahead and signed up for that today. I’ve read a lot about Pose but just can’t seem to get it right on my own. So…we’ll see what they can teach me. OHHH…I also had a non-blister run yesterday! For those of you that know me, that is almost unheard of at this distance. I think I may have found the “magic socks” as Clara puts it. This also has me thinking I should go ahead and try to do the marathon instead of the 1/2. My real concern was blisters (well, that and being afraid I wouldn’t finish!). 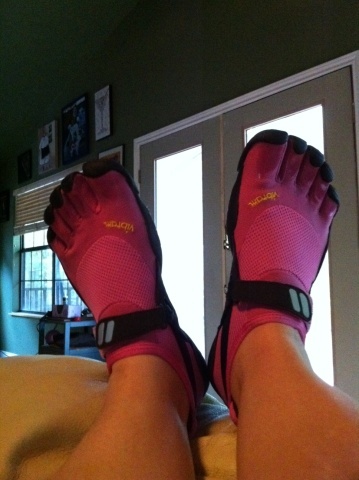 I didn’t want to have blisters all over my feet because of the marathon so I was going to drop down to a 1/2. We’ll see how training goes from here on out. I’ll keep you up to date! 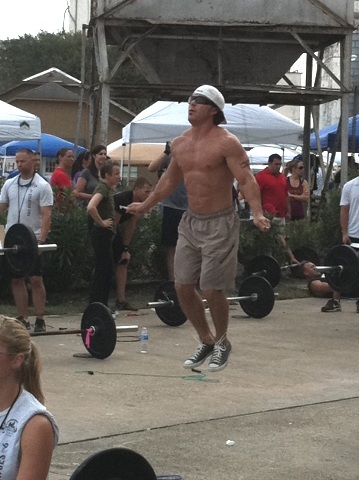 This entry was posted in Workout and tagged Burpees, Crossfit, Crossfit Competition, GHD Sit Ups, Race Training, Ring Dips, Sumo Deadlift High Pull on September 19, 2011 by Tammy. As many reps as possible of Overhead Weighted Lunges (10#). Every minute, on the minute, 10 push ups. I tried to keep count as best as possible, but I may have goofed up. My lunges aren’t very deep thanks to my lovely knees. Next time I may try to do all of them touching the ground but I’ll have to go slow to make sure I don’t tweak anything. Great workout. Got tough at the end. I skipped my workout on Thursday. My legs and arms were quite sore, but that wasn’t why I skipped. Mike and I went to a friend’s. 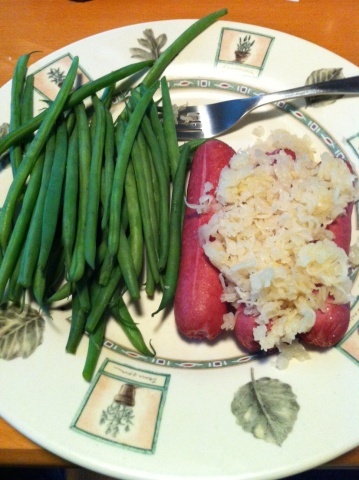 This entry was posted in Workout and tagged Crossfit, Pull Ups, Push Ups, Split Jerk, Sumo Deadlift High Pull, Weighted Lunges on July 1, 2011 by Tammy.